The install went quickly with no problems, and no damage or disruption to our home. 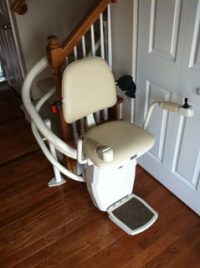 While we have not had much time to use it, we are pleased so far, in the appearance and performance of the stairlift. 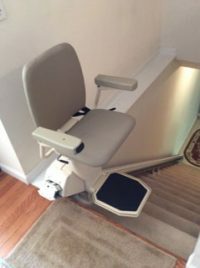 I selected the stairlift from information on the internet, and as a design engineer, I particularly liked the worm drive mechanism, and the materials used. Rob Williams of Merrett Stairlifts was well informed when we first spoke regarding the lift, and he quickly measured the install area, and answered all our questions. We immediately signed a contract for the lift. The SL600 stairlift was installed today by Merrett Stairlifts, and Rob Williams the owner did the install. Rob was exactly on time for the install, came with the proper tools, the parts having been unboxed outside so there was no trash in our house. Rob immediately began the install, and appeared quite knowledgeable regarding the product and the installation techniques and requirements. The install went quickly with no problems, and no damage or disruption to our home. He explained and demonstrated the lift operation, and tested it. I then tried it, and was pleased with the smoothness and quietness of the system. 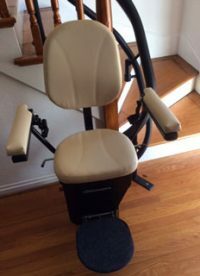 It appears that Harmar has a very nice product, and you should be pleased with the fine customer service demonstrated by Merrett Stairlifts in the St. Louis area. I am confident that Merrett will be there if I ever need any service. I had to reschedule install 4 times and they made every accommodation for me. When it was installed it was done exactly when they said and everything was cleaned up as though they had never been there. This morning I was taking my Dad who is staying with us to an appointment and the lift wouldn't work. Merrett was here within 15 minutes and it was fixed within 30 minutes of arrival, at no charge! They also have an excellent buy back, don't try to do this yourself on Craigslist, you will not save any money. I tried and went with Merrett. I cannot thank you enough for all of your help during this stressful, confusing and anxious time. After your thoughtful response to my initial email, I knew that I was contacting the right person for the job. I greatly appreciate you walking me through the process and keeping things simple. It’s a trying time for my family right now and while my Mother-in-law is focused on caring for my Father-in-law out of town, you were so flexible and understanding in working with me. You’ve really made this an easy process and a very easy decision. Most of all, you’ve relieved the stress and worry of my father-in-law falling on the stairs. He can now safely make the trip up to the comforts of his own room. Thank you so much for you time, your help and your patience with us through this process! 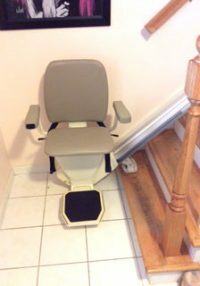 For years, my husband wanted to get me a stairlift and I stubbornly refused. I have a heart condition that makes it difficult for me to go up and down stairs without getting winded. But finally, my husband just went ahead and got me one (which he installed) and it has been the best thing ever! It gives me so much freedom to do things within my own house. I wish I had let him do it sooner! 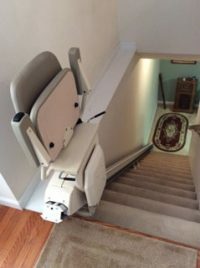 I needed a stair chair in my new home for one of my parents, but I wasn't sure it was possible since the staircase was in two parts with a landing in between. 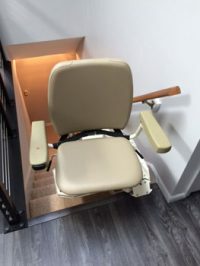 Merrett Stairlifts installed two stairlifts - one for each flight - and it has worked out great! 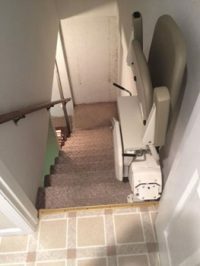 Merrett was extremely professional and the installation was done so well that the stairlift looks like it was made specifically for the house! Merrett Stairlifts installed a stair lift in my home so that my mother could go downstairs to our family area when she visited. It also turned out extremely useful when my husband was sick with cancer. 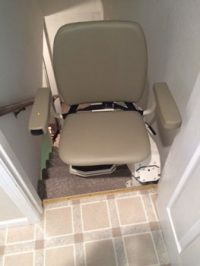 Merrett is one of the nicest men you will ever meet and he did a fantastic job helping me choose the right stair lift for my home and budget, and he did a great job installing it. I highly recommend him.